13 ½” X 19” serigraph print--contemporary design. This poster features a unique sceen technique called the "split fountain" where two colors are introduced onto a screen at the same time--blending together to make each poster totally unique. 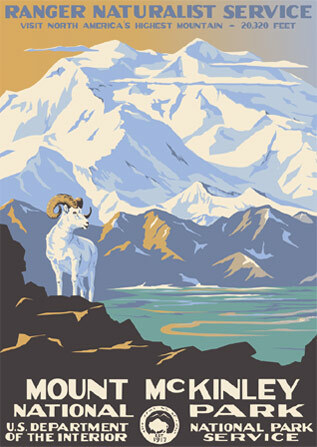 This contemporary design uses the historic name "Mount McKinley" as it would have appeared in the WPA era, not Denali as it is known today. The park was formed in 1917 to preserve the Dall sheep, featured in this design and not the mountain.